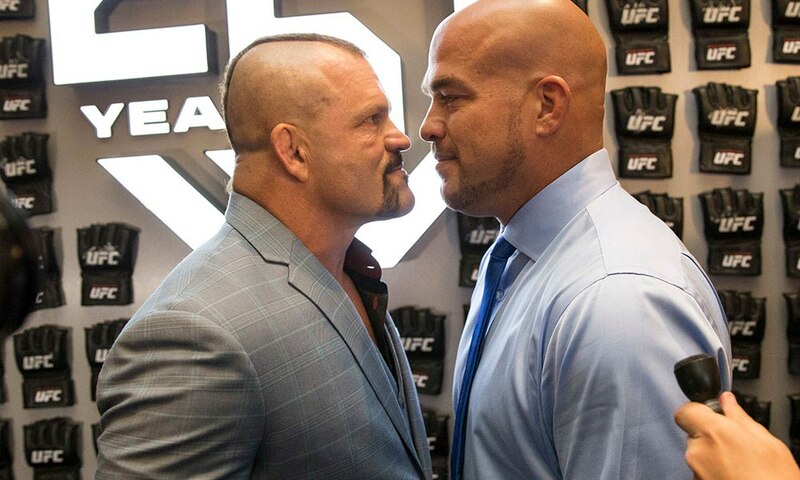 The Tito Ortiz vs. Chuck Liddell trilogy fight appears to be official. The 43-year-old Ortiz (19-12-1 MMA, 15-11-1 UFC) and 48-year-old Liddell (21-8 MMA, 16-6 UFC), both members of the UFC Hall of Fame, will fight for a third time in November in a pay-per-view fight promoted by former boxing star-turned-promoter Oscar De La Hoya. ESPN.com today first reported the fight is set for Nov. 24 at The Forum in Inglewood, Calif. A price point for the fight has not yet been announced. But De La Hoya told ESPN.com he plans on becoming a regular MMA promoter now, to go along with his boxing events. Ortiz had what he said was his retirement bout at Bellator 170 in January 2017. There, he submitted Chael Sonnen. Bellator President Scott Coker earlier this year confirmed to MMAjunke that Ortiz is no longer under contract with the promotion. Liddell hasn’t fought since June 2010, when he suffered a knockout loss to Rich Franklin that marked his third straight knockout loss. He officially retired later that year and took a job with the UFC as a brand ambassador. Liddell owns knockout wins over Ortiz, his former training partner and heated rival, in their previous fights under the UFC banner. At UFC 47 in April 2004, he knocked Ortiz out 38 seconds into the second round. At UFC 66, he retained his light heavyweight title with a third-round TKO in December 2006. The second win over Ortiz gave Liddell seven straight wins, and at the time made him arguably the biggest star in the sport. He lost his title his next time out by TKO to Quinton Jackson, which started a slide of five losses in his final six fights – four by knockout.